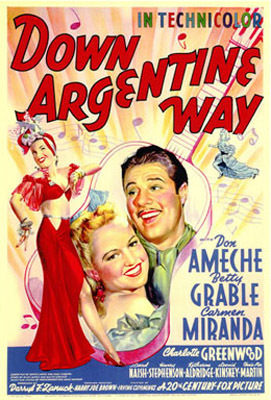 « “Forgotten Hollywood”- When Hollywood and History Collide..
~ Down Argentine Way (1940) – Betty Grable’s first starring role in a Technicolor musical happened only because Alice Faye had an attack of appendicitis, but Grable took advantage of the situation and made herself as important to 20th Century Fox as Faye. Released a year before America entered World War II, this film and others starring Grable established her as the pinup queen. Carmen Miranda made her American film debut, and the Nicholas Brothers’ unparalleled dance routines dazzle. ~ The Power and the Glory (1933) – Preston Sturges’ first original screenplay, it’s a haunting tragedy in sharp contrast to the comedies of the 1940s that established him as one of America’s foremost directors. Compared favorably to novels by Henry James and Joseph Conrad for its extensive mix of narration with dramatic action (Fox Studios coined the word narratage to publicize the innovative technique), The Power and the Glory introduced a non-chronological structure to mainstream motion pictures that later influenced the production of Citizen Kane. Spencer Tracy’s performance was one of the fullest characterizations ever achieved on screen. ~ Rio Bravo (1959) – As the legend goes, this Western directed by Howard Hawks was produced as a riposte to Fred Zinnemann’s High Noon. John Wayne stars and is supported by Walter Brennan, Dean Martin and Ricky Nelson. Angie Dickinson is the love interest, and Claude Akins, Ward Bond, and Pedro Gonzalez are also featured. A smart Western where gunplay is matched by wordplay, Rio Bravo is a terrific ensemble piece and it’s director Hawks’ last great film. 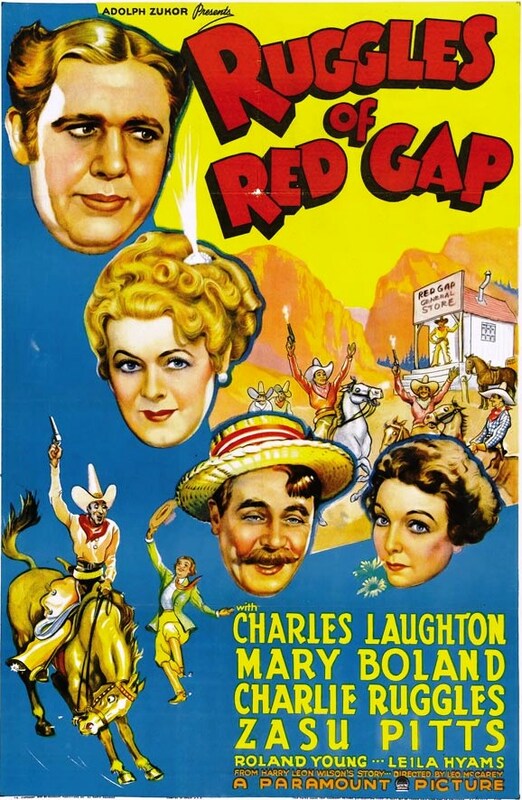 ~ Ruggles of Red Gap (1935) – Charles Laughton is known for such serious roles as Nero, King Henry VIII, and Captain Bligh. He took on comedy in this tale of an English manservant won in a poker game by Charlie Ruggles, a member of Red Gap, part of Washington’s social elite. Aided by ZaSu Pitts and Roland Young, Laughton really shows his acting range. It didn’t hurt that Leo McCarey, who had just worked with W.C. Fields, was in the director’s chair. McCarey, who could pull heartstrings or touch funny bones with equal skill, started his long directorial career working with such comedic icons as Laurel & Hardy, and he created several beloved American films. ~ State Fair (1933) – For director Henry King to create a film that celebrated an institution as beloved as the State Fair, it required the presence of a cherished and steadfast star; in this case, America’s favorite cowboy Will Rogers. The humorist found a superlative vehicle for his homespun persona in this small town slice-of-life setting. He is assisted by Janet Gaynor, Lew Ayres, and Sally Eilers. ~ The Gang’s All Here (1943) – Although not remembered as well today as those put out by MGM, 20th Century-Fox’s big Technicolor musicals stand up well in comparison. Alice Faye was Fox’s #1 musical star. Carmen Miranda and her outrageous costume is highlighted in the legendary musical number The Lady in the Tutti Frutti Hat. Busby Berkeley, who had completed stints choreographing musicals at MGM and at Warner Bros., directed this gem. 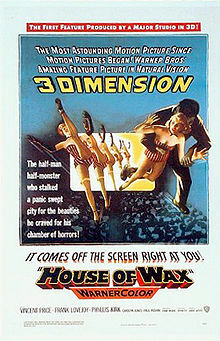 ~ House of Wax (1953) – A remake of 1933’s Mystery of the Wax Museum, the House of Wax expanded upon the earlier horror tale of a mad sculptor who encases his victims’ corpses in wax. It was produced by Warner Bros., and is considered the first full-length 3-D color film ever produced by a major film studio. Along with its technical innovations, House of Wax also solidified Vincent Price’s new role as a master of the macabre. Phyllis Kirk, Frank Lovejoy, and Carolyn Jones complete the cast. Other added celluloid include… Saving Private Ryan, Little Big Man, Rosemary’s Baby, Ferris Bueller’s Day Off, The Big Lebowski, and Willie Wonka and the Chocolate Factory. This entry was posted on Thursday, December 18th, 2014 at 1:26 am	and is filed under Blog by Manny Pacheco. You can follow any comments to this post through the RSS 2.0 feed. Responses are currently closed, but you can trackback from your own site.